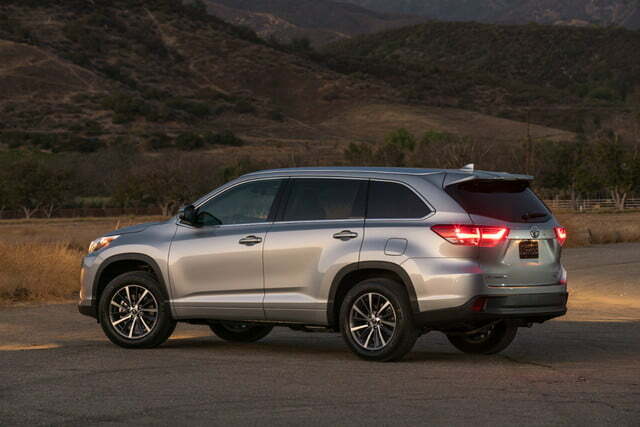 The 2018 Toyota Highlander is the newest version of one of the original crossovers, vehicles with an SUV body on a car platform. 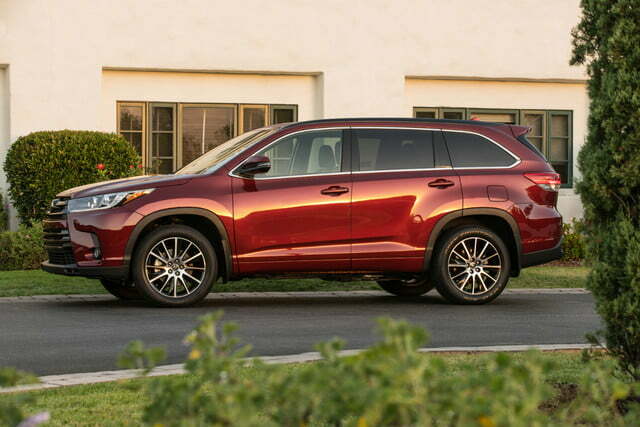 Unchanged from the 2017 model year, the midsize 2018 Highlander has been one of the most popular Toyota models since its first-generation launch in 2001. In 2016, 191,379 U.S. sales placed Highlander 10th overall in the increasingly hot crossover/SUV category. So far in 2017, based on unit sales through November, Highlander sales are tracking a bit higher, putting it in eighth place. 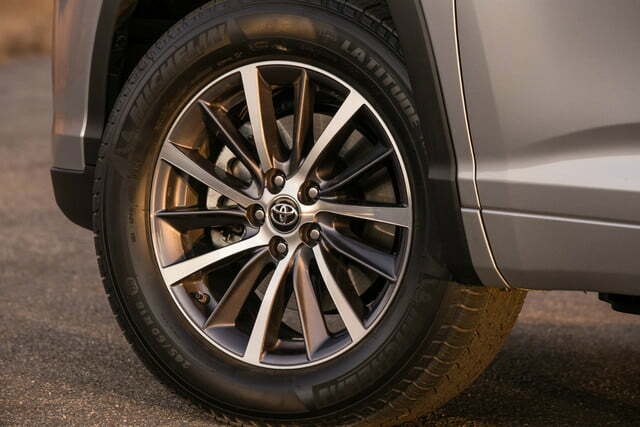 Toyota’s RAV4 compact crossover is the top seller and has outsold the Highlander since 2006, but that doesn’t take away from the Highlander’s appeal. It’s worth mentioning that Toyota sold more Highlanders in the U.S. in 2016 than the combined sales of the brand’s three body-on-frame true SUVs, the 4Runner (111,952), Sequoia (11,001), and Land Cruiser (2,710). Highlanders use three very different engines. 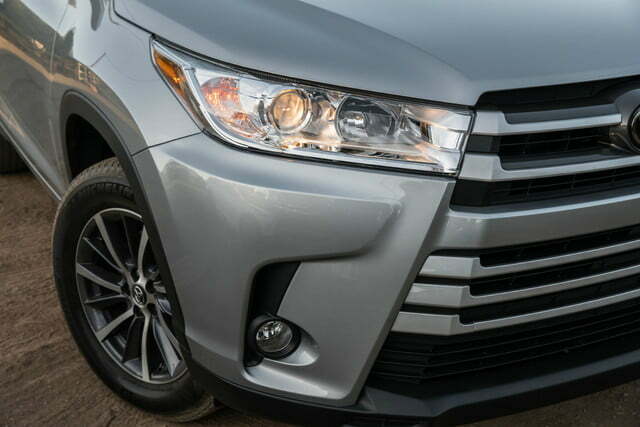 A 2.7-liter DOHC four-cylinder engine rated for 185 horsepower at 5,800 rpm and 184 pound-feet of torque at 4,200 rpm is the standard engine on the front-wheel-drive Highlander LE, the basic trim. The 2.7-liter engine is paired with a six-speed electronically controlled automatic transmission with sequential shift modes and a snow mode. Running on regular gas, the engine is Environmental Protection Agency-rated to average 20 mpg in city driving and 24 mpg on the highway, with a combined 22 mpg rating. 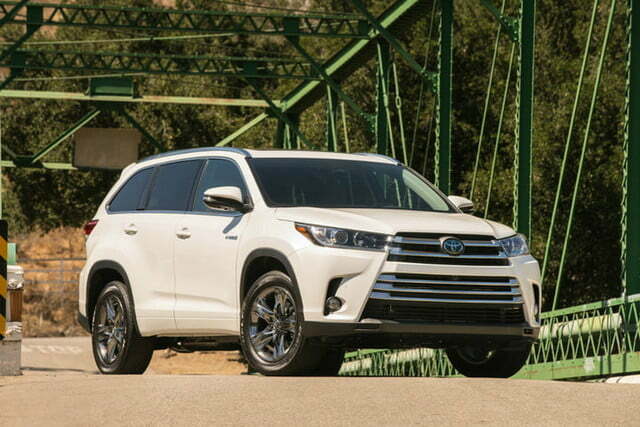 The second engine, which is standard equipment on the all-wheel-drive Highlander LE and all other non-hybrid models, is a 3.5-liter DOHC V6. The six-cylinder produces 295 hp at 6,600 rpm and 263 lb-ft at 4,700 rpm. An eight-speed direct shift electronically controlled automatic transmission is used with the V6. EPA ratings vary depending on the trim level and drive type with the V6, and are listed in the table below. The three Highlander Hybrid trims use the same engine, a 3.5-liter V6 DOHC mill combined with an electric motor powered by a nickel-metal hydride battery. 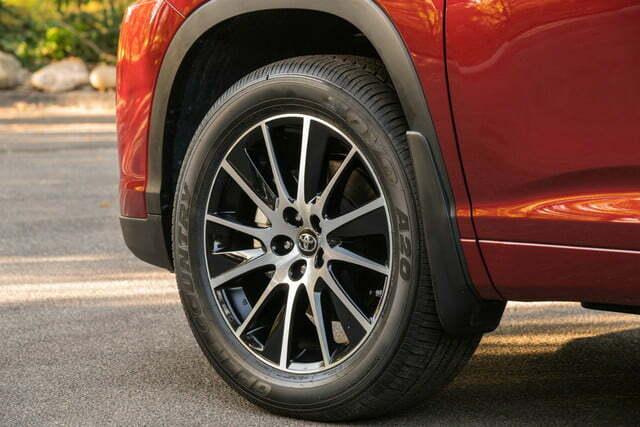 All 2018 Highlanders have tire pressure monitoring, hill start assist control, and rearview cameras that use the infotainment display to help when you’re backing up. Toyota Safety Sense P (TSS-P) and Star Safety System, two safety packages standard on most Toyotas, are included with all Highlanders. Toyota Safety Sense P (TSS-P) includes the following passive safety and driver assist tech features: pre-collision system with pedestrian detection, lane departure alert with steering assist, auto high beams, and dynamic radar cruise control. The Star Safety System refers to automatic mechanical protections. This suite comes with enhanced vehicle stability control, traction control, antilock brakes, electronic brake-force distribution, brake assist (adds braking force in emergency stops), and smart stop technology. All-wheel drive (AWD) Highlanders also have downhill assist control. Additional passive safety and driver assist features are outlined in the trim description sections below. To keep the choice simple, without digging into specific accessories for each of the 10 distinct Highlander choices, decide first on hybrid or non-hybrid, then the relative level of comfort and convenience features, and finally whether you want front-wheel drive (FWD) or AWD. That last decision is only necessary with Highlanders with conventional gasoline engines. The six conventionally powered Highlanders — all available with FWD or AWD — include five with relatively more luxury and convenience as their prices rise and one, the SE trim, with sportier styling. The four hybrid choices — all AWD — have feature sets nearly identical to the non-hybrids. The overall base price range is wide, from $31,030 to $48,280, so your decisions can mean a significant cost difference. The 2018 Highlander LE, starting price $31,030, is the basic crossover and the only trim with a standard four-cylinder engine and six-speed automatic. The LE’s exterior features include projector beam halogen headlights with auto on/off, daytime running lights with on/off, LED tail and brake lights, and heated power outside mirrors with turn signal indicators. LEs also have UV reduction glass, an engine immobilizer, a color-keyed rear spoiler with LED brake light, and privacy glass on the rear side, quarter, and liftgate windows,. Interior LE features include front and rear manual air conditioning, an integrated backup camera with a projected path, and a 4.2-inch LCD multi-information driver display. You’ll sit on fabric seats and have access to the LE’s cruise control, remote keyless entry with remote illuminated entry, power windows, power door locks, and two 12V auxiliary power outlets and five USB ports. 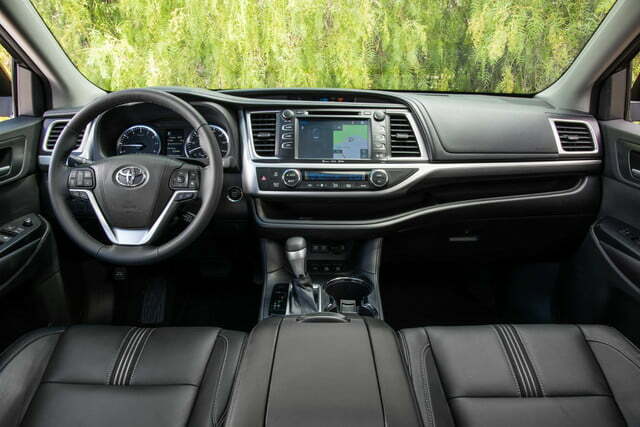 The Highlander LE has Toyota’s base Entune Audio infotainment system with a 6.1-inch touchscreen display, AM/FM CD player with MP3 and WMA compatibility, six speakers, Bluetooth phone and streaming audio support, Siri Eyes Free, and USB, aux, and iPod connections. 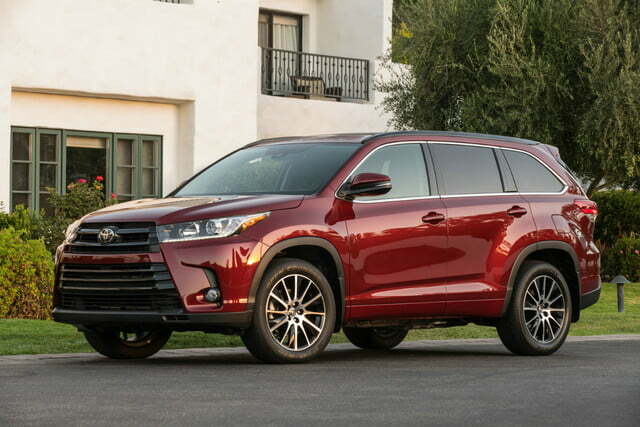 Moving up to the 2018 Highlander LE Plus, starting price $35,460, adds the following to the LE trim: integrated fog lights, a flip-up rear hatch window, height-adjustable power liftgate with jam protection, and fancier 18-inch aluminum alloy wheels. The LE Plus also has three-zone automatic climate control, fabric and SoftTex trimmed seats, an 8-way power adjustable driver seat with thigh and lumbar support, and a leather-trimmed steering wheel with audio, phone, voice, and cruise control buttons. The LE Plus gets the next level Entune infotainment system. Entune Audio Plus with Connected Navigation has an 8-inch touchscreen display and SiriusXM Satellite Radio, and uses your connected smartphone to power the navigation system. You’ll begin to get a sense of luxury with the 2018 Highlander XLE, starting price $38,920. The XLE trim feature list includes everything in the LE Plus and adds a blind spot warning indicator on the side mirrors, power tilt/slide moonroof, roof rails, and even fancier 18-inch aluminum alloy wheels. 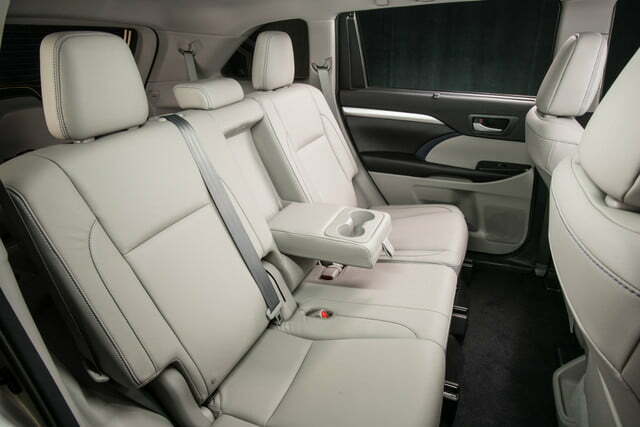 Inside the XLE you’ll find a 4.2-inch LCD color multi-information driver display, navigation with turn-by-turn directions, leather seats with heated front seats and power adjustable passenger seat, and second-row bucket seats with a side table. XLEs also have a smart key system with push-button start, an auto-dimming rearview mirror, second-row retractable window sunshades, and Driver Easy Speak, a feature that amplifies the driver’s voice and plays it through the rear speakers. The XLE’s Entune Premium Audio with Integrated Navigation and App Suite doesn’t need your smartphone for trip directions or apps. The XLE and higher trims have an antitheft system with alarm and engine immobilizer. 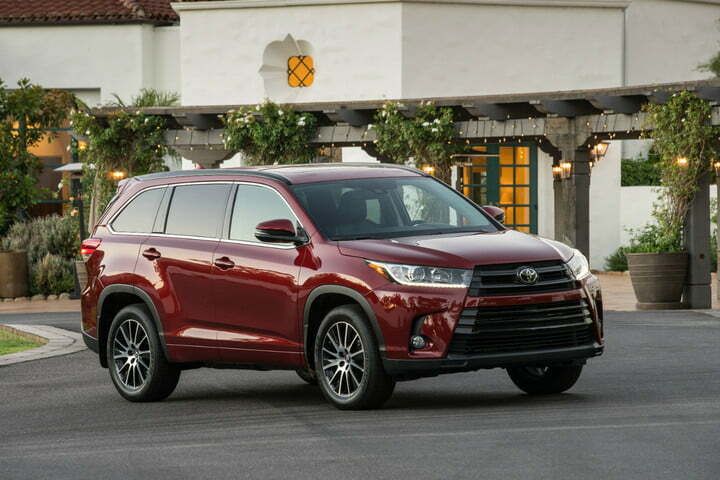 The 2018 Highlander SE, starting price $40,090, is similar to the XLE but has dark-painted body accents and 19-inch aluminum alloy wheels. Mechanically, the SE is like the other Highlanders with the gas-only V6. The SE adds projector-beam halogen headlights with auto on/off and integrated LED daytime running lights, distinctive black leather seats, and blue LED ambient interior lighting. The SE has the same Entune Premium Audio infotainment as the XLE. The first of the two top luxury trims, the 2018 Highlander Limited, starts at $42,080. The Limited has everything that comes with the XLE and SE trims and adds puddle lamps on the outside mirrors, chrome body accents, and 19-inch Chromtec wheels. 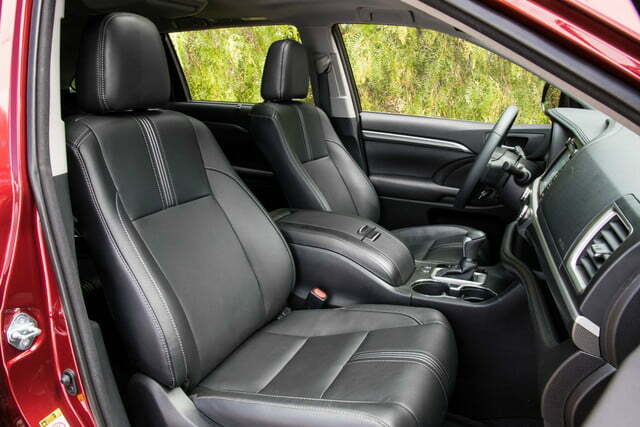 Inside the crossover, the Limited trim has dynamic guidelines with the backup display, perforated leather seat trim, heated and ventilated front seats, wood-grain accent and leather trim interior, power windows with auto up/down for all four windows, and a rear cargo cover. The Highlander Limited and Platinum both come with the top-of-the-line Entune Premium JBL Audio with Integrated Navigation and App Suite. This system has 12 JBL GreenEdge speakers and loads of audio, travel, and information apps. Limited trims also include rear parking assist sonar. If you find you’re adding too many options to the Limited, bite the bullet and jump to the 2018 Highlander Limited Platinum, the top trim, starting at $45,200 but already equipped with the packed option list. The top trim Highlander adds to the Limited’s features with a panoramic moonroof, outside mirrors with memory and Highlander graphic projection, 19-inch dark Chromtec wheels, and rain-sensing windshield wipers. 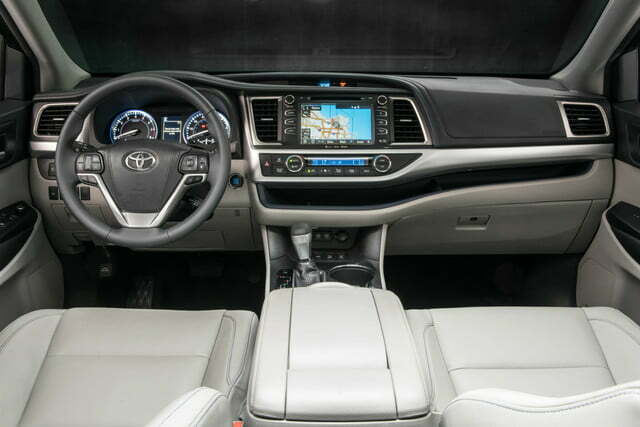 The Limited Platinum model has a bird’s eye view camera with perimeter scan, heated steering wheel and second-row seats, and Toyota’s Safety Connect subscription-based telematics system. 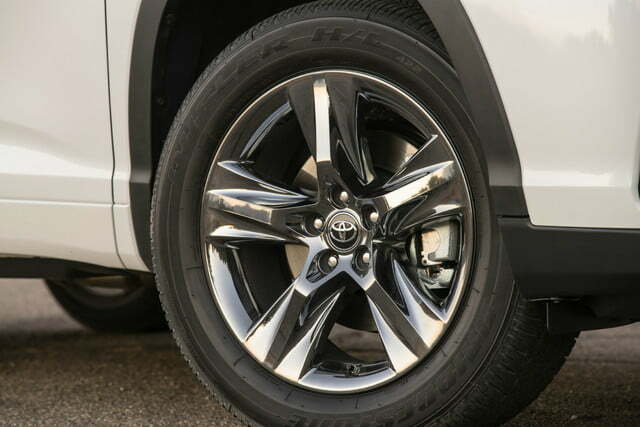 The Limited Platinum’s driver assist package includes both front and rear parking assistance. 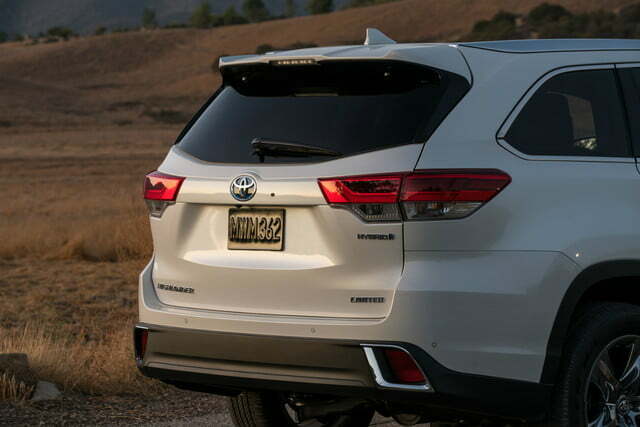 The four Highlander Hybrid trim levels are nearly identical to the AWD versions of their non-hybrid counterparts. All hybrid trims are AWD only, plus they have the hybrid gas/electric engine with a continuously variable transmission, as well as regenerative braking to recharge the battery. There are no hybrid versions of the LE Plus or SE trims. 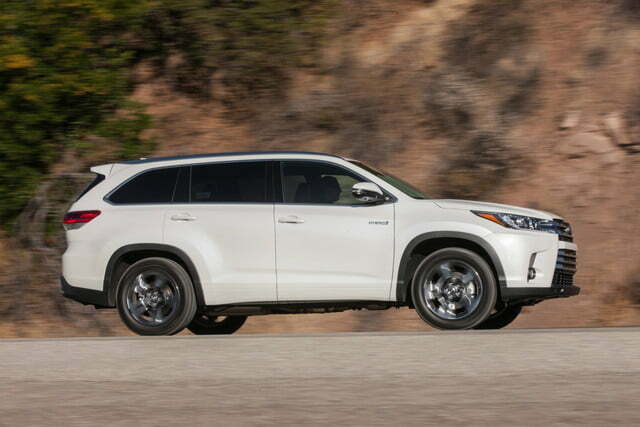 Highlander Hybrid starting prices range from $36,670 for the Hybrid LE to the Hybrid Limited Platinum’s $48,280. The price difference between the hybrid and non-hybrids ranges from $1,350 to $2,130. The Hybrid LE has the greatest difference from the gas-only model, but that is explained by the higher feature level on the Hybrid LE. On average, choosing a hybrid Highlander costs $1,680 additional and helps to pay for itself with an average of 6 mpg greater fuel economy — based on the respective EPA combined driving averages. The base level 2018 Hybrid LE, starting price $36,670, is the same on the outside as the conventional engine-powered LE but you get more inside features with the hybrid version. The Hybrid LE’s $2,130 price bump compared to the non-hybrid version with AWD is balanced by the extra offerings. 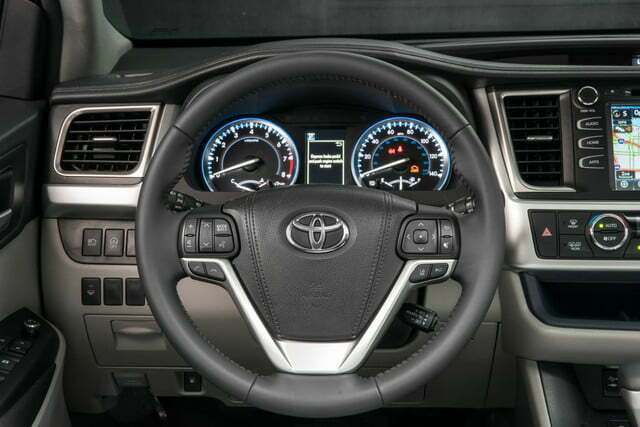 The hybrid’s interior upgrades from non-hybrid trim include three-zone automatic climate control, a color 4.2-inch multi-information driver display, hybrid-related instrumentation, and a smart key system with push-button start. 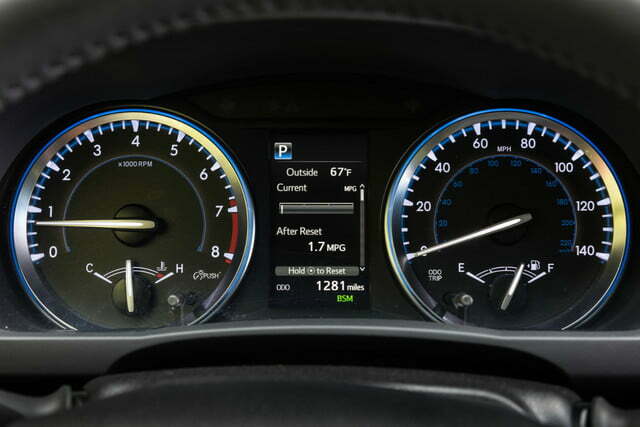 The Hybrid LE has the base Entune Audio infotainment system, identical to the non-hybrid setup. 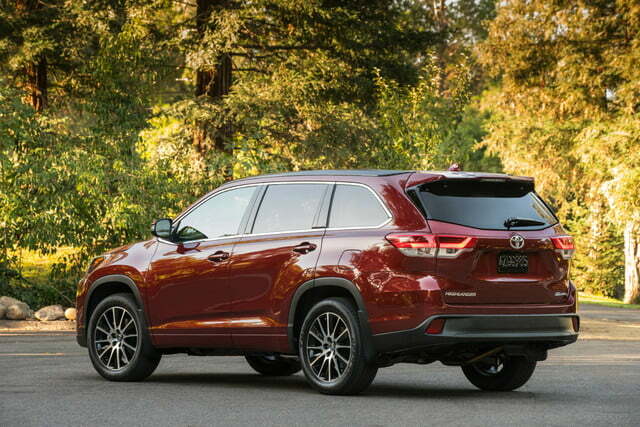 Stepping up to the first level of hybrid crossover luxury, the Hybrid XLE, with a $41,730 starting price, has the same specs as the non-hybrid Highlander XLE, with the addition of the hybrid instrumentation. 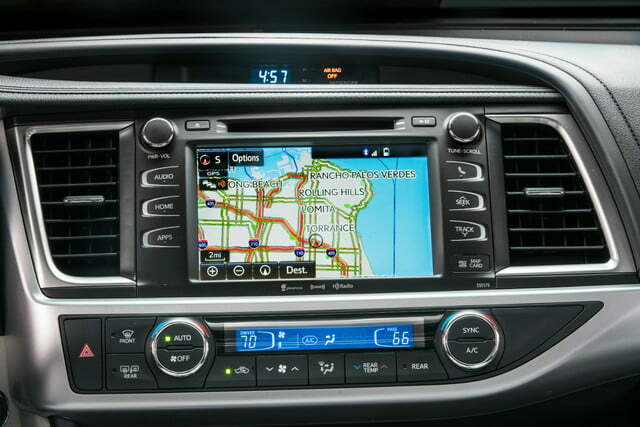 The Hybrid XLE is equipped with the Entune Premium Audio with Integrated Navigation and App Suite. The Highlander Hybrid Limited (starting price $45,160) and Limited Platinum (starting price $48,280) have the same feature set as the non-hybrid versions, including the Entune Premium JBL Audio infotainment system with navigation and apps plus identical passive safety and driver assist tech.